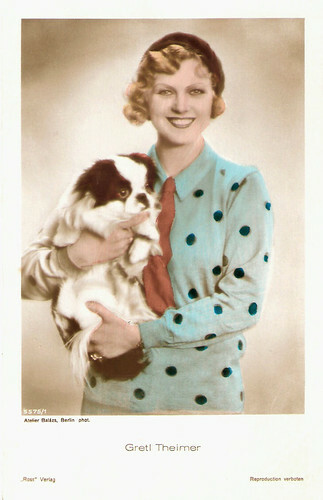 Ross Verlag published a series of postcards for Great Britain without the Ross Verlag name on the cards. Instead, they had the word 'Foreign' in one corner of the photo on the card. These were all hand-tinted colour postcards with a gloss finish. Although the Ross Verlag number was still visible on the front of these cards, they also usually had another number on the back in the stamp box. Besides these cards for the British market, Ross Verlag also published several hand-coloured postcards for the continental market. Liane Haid. German postcard by Ross Verlag, no. 1732/2, 1927-1928. Photo: Ufa. 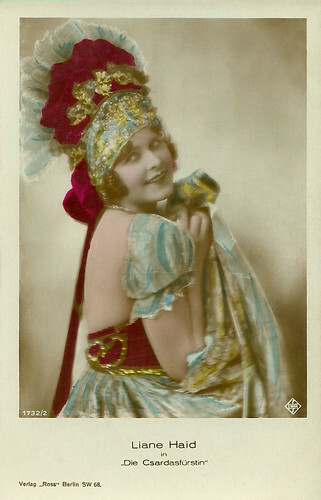 Publicity still for Die Csardasfürstin/The Csardas Princess (Hanns Schwarz, 1927). Collection: Didier Hanson. Karina Bell. German postcard by Ross Verlag, no. 2094/1, 1927-1928. Photo: Ernst Schneider, Berlin. Collection: Didier Hanson. Harry Piel. German postcard by Ross Verlag, Berlin, no. 3343/2, 1928-1929. Photo: Ufa. Publicity still for Panik/Panic (Harry Piel, 1928). Adolphe Menjou and Kathryn Carver. British postcard by Ross Verlag, no. 3384/1. Photo: Paramount. 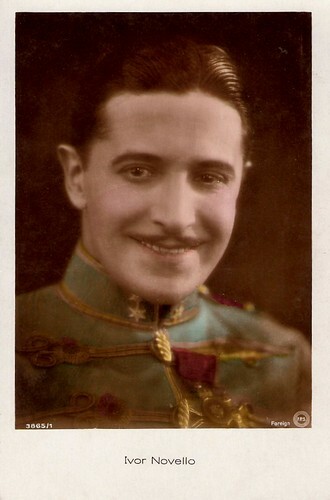 Publicity still for Service for Ladies (Harry d'Abbadie d'Arrast, 1927). 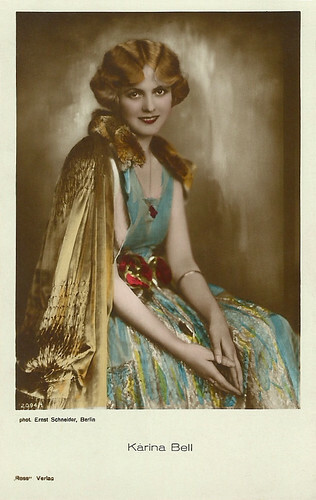 Vilma Banky. German postcard by Ross Verlag, no. 3482/2, 1928-1929. Photo: United Artists. Collection: Joanna. Alice Terry and Iván Petrovich. British postcard by Ross Verlag, no. 3538/1. Photo: Metro-Goldwyn-Mayer. Publicity still for The Garden of Allah (Rex Ingram, 1927). 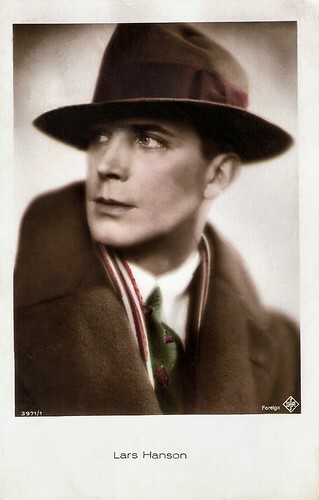 Ivor Novello. British postcard, no. 3865/1. Photo: FPS. 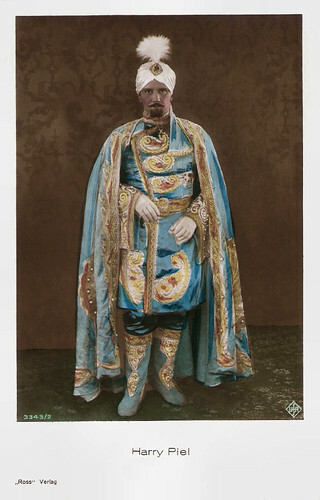 At the backside: Real Hand-coloured Photograph. 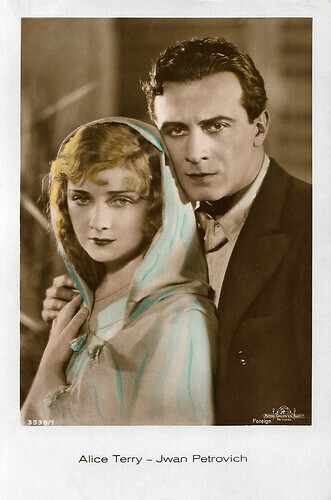 Greta Nissen and Charles Farrell. British postcard by Ross Verlag, no. 3917/1, 1928-1929. Photo: Fox. Publicity still for Fazil (Howard Hawks, 1928). Lars Hanson. British postcard by Ross Verlag, no. 3971/1, 1928-1929. Photo: Ufa. 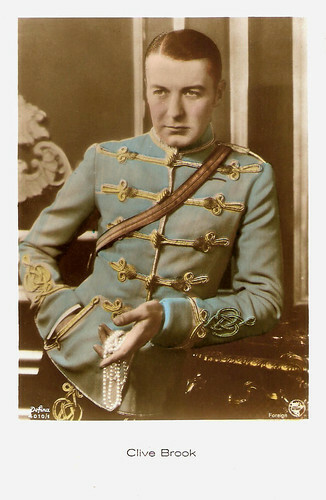 Clive Brook. British postcard by Ross Verlag, no. 4010/1. Photo: Defina / First National Pictures. 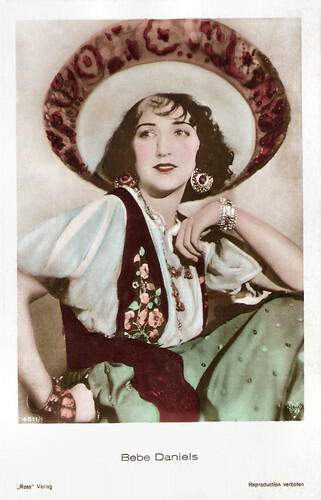 Bebe Daniels. German postcard by Ross Verlag, no. 4811/1, 1929-1930. Photo: RKO Radio Pictures. Collection: Geoffrey Donaldson Institute. 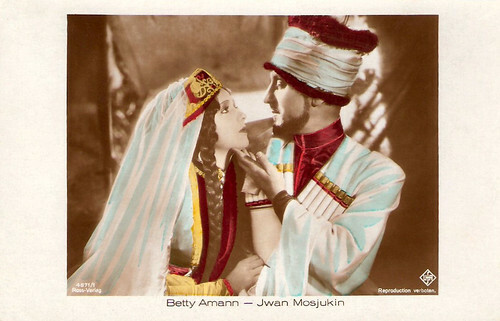 Betty Amann and Ivan Mozzhukhin. German postcard by Ross Verlag, no. 4871/1, 1930. Photo: Michael Powell / Ufa. Publicity still for Der Weisse Teufel/The White Devil (Alexandre Volkoff, 1930). Gretl Theimer. German postcard by Ross Verlag, no. 5575/1, 1930-1931. Photo: Atelier Balázs. Source: Mark Goffee (Ross Verlag Movie Star Postcards). It is Postcard Friendship Friday, hosted by Beth at the The Best Hearts are Crunchy. You can visit her by clicking on the button below.